Standard intersection. 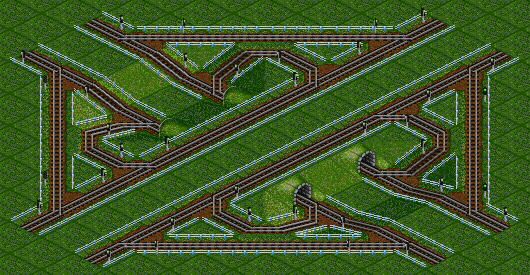 The easiest (efficient) intersection for two-way designs. 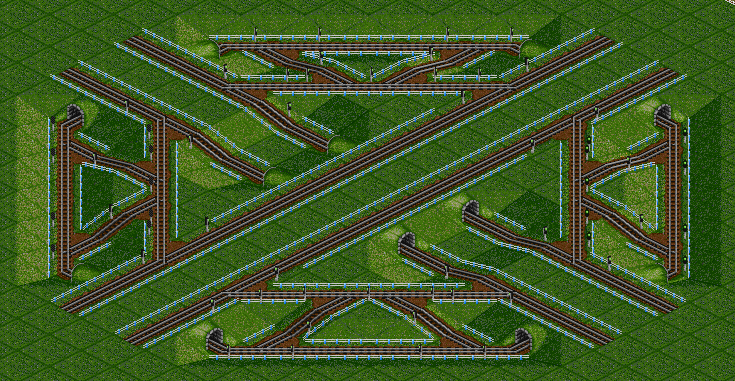 Basically a cloverleaf-design without any optimizations. Needs 13x13 tiles. I've first seen this design on Paul van Eijden's site, though it's pretty straight forward, so it may published on many other sites, too. You can also build a nice version with servicing depots. 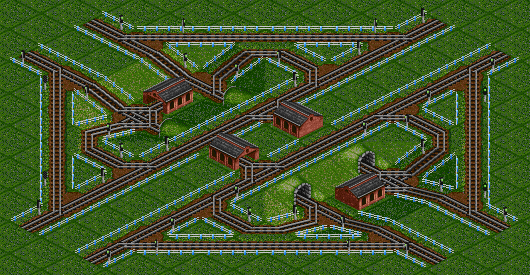 Cross intersection. This intersection looks kind of like a celtic cross. 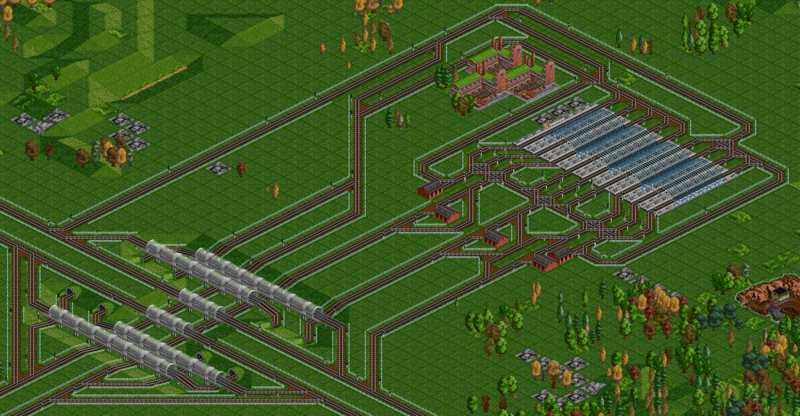 It has quite efficient left-turns but needs lots of space. Long intersection. A quite long and not very wide design. Shorter versions are possible, but not very efficient and deadlock prone. Normal junction (threeway). 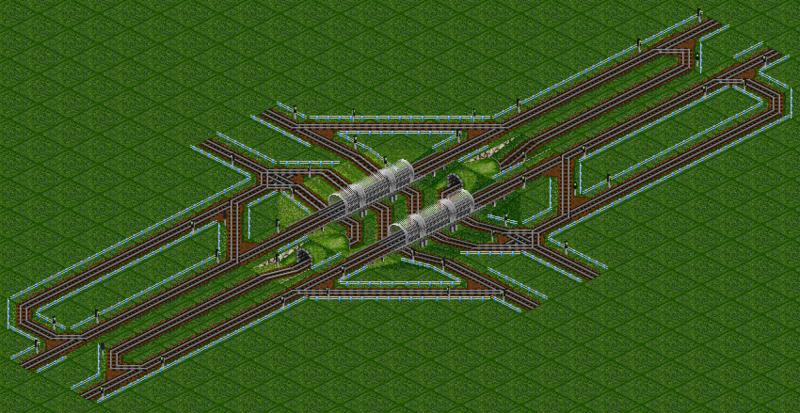 Quite simple, complex and efficient design of a junction. Traffic is leaving the main line before other trains may join. In fact, only trains which are passing through ever go over the center-bridges. Standard terminal station. Actually a trivial design. Mostly here for completeness. 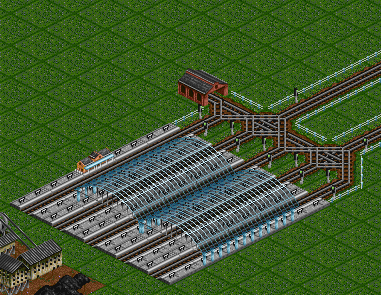 I sometimes use it for loading-only stations (coalmines, farms) and mostly build city-stations like this since layout can be build very close to the houses..
Standard through station. Still a simple design, but a good one. I build most stations like this. The advandage is that one train can enter and another one can leave at the same time. High performance station. 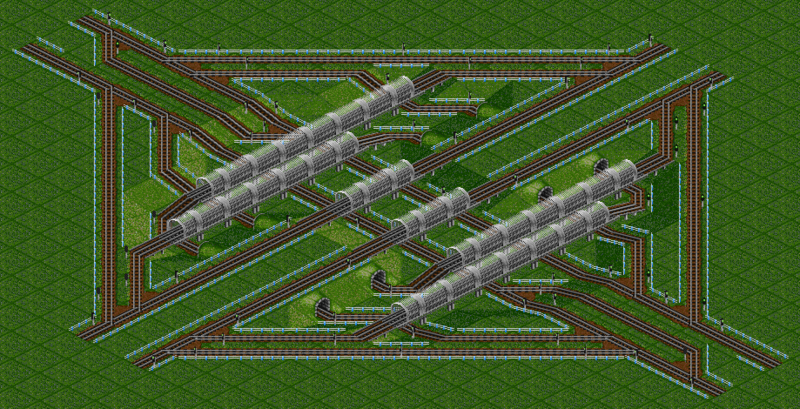 Design for stations with more traffic (factories, mostly). 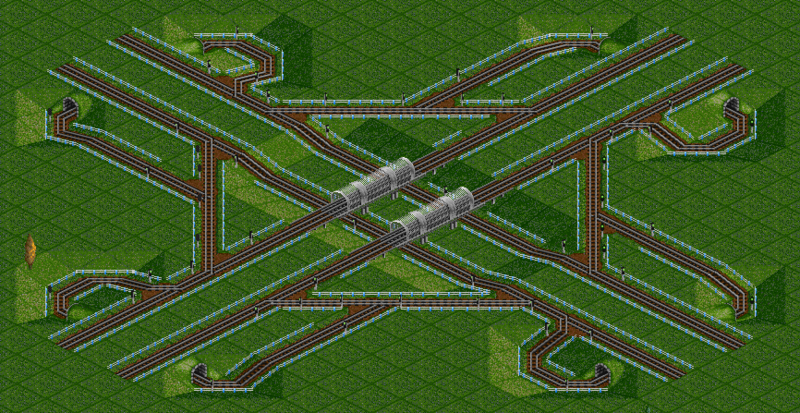 Two trains can enter and another one can leave at the same time. To increase performance the lines from and to the junction have been left seperated. 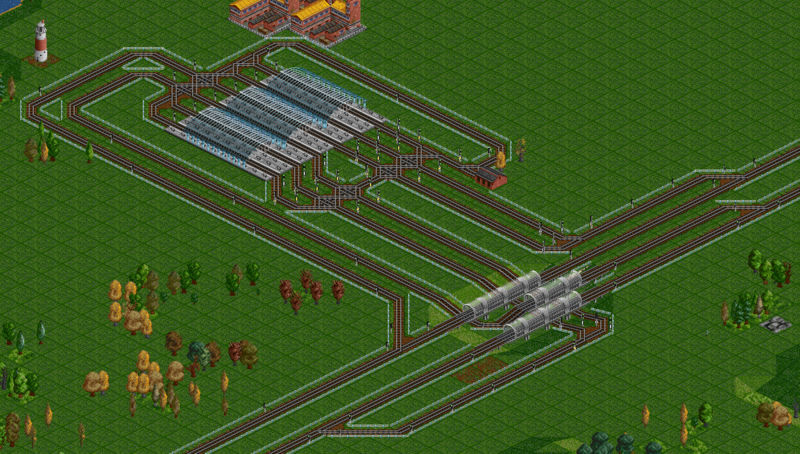 Also, the enter-lines are split so trains waiting to enter don't block the main line. 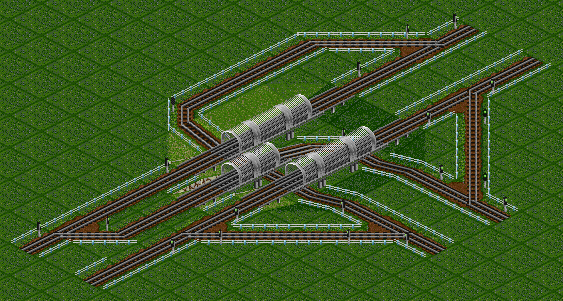 I'd say a station connected like this can handle up to 20 trains. Ultra high performance station. 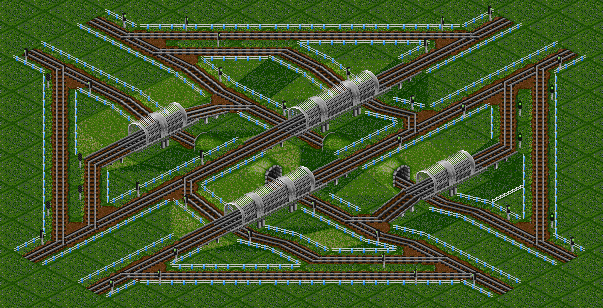 For very high traffic volumes (the only factory you're delivering to) you can take the ideas of the "High performance station" and take it a step further: An entire branch of a big intersection is connected to a station with nine platforms. 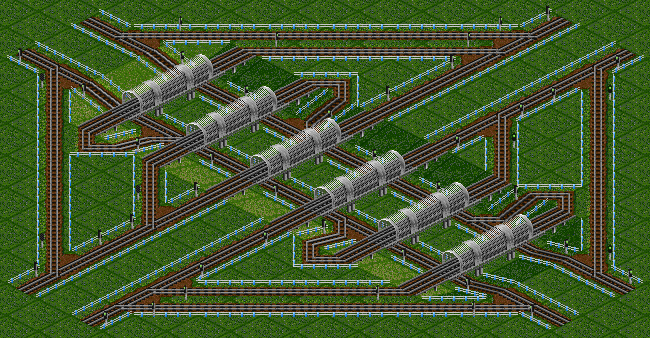 Three trains may enter and two leave - all at the same time. Stations like this are still bored when used by 30 trains, I'd say 50 trains should still work, but haven't actually tried. For (possibly) more performance the mandatory servicing may be omitted, of course..